As I have said before, the folks at Nebbiolo Prima organized afternoon meetings with the winemakers, and on the third day I decided to visit the Antica Casa Vinicola Scarpa, which is a bit further than some -- in Nizza Monferrato. Despite their location in the heart of the Astigiano they make both Barolo and Barbaresco, because they always have -- the winery was founded 150 years ago by a winemaker from the Veneto, Antonio Scarpa, and more recently was directed by the late Mario Pesce, one of the great winemakers of the Astigiano, who passed the scepter on to Maria Piera Zola and her family -- and since they were already making Barolo and Barbaresco when the Disciplinare governing the Appellations was drawn up, they were given permission to continue making it. In terms of provenance, their Barbaresco is from Neive, their Barolo is from La Morra, and their Nebbiolo from Montu Roero. In addition to making Barolo and Barbaresco, they make two Crus of Barbera: Bugliona, which is from a vineyard whose soils are more calcareous and have a gypsum vein, and I Bricchi, from a vineyard whose soils are redder. 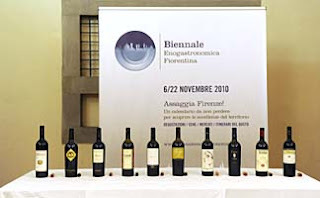 And they make a number of other interesting wines, including a Ruchè that they label Monferrato Rosso DOC because the vineyard is outside the Ruchè di Castiglione Monferrato DOCG production area, and a wine from Albarossa, which is a Nebbiolo-Barbera cross developed in 1939 by Professor Dalmasso. Recently bottled, and they want to underline that. Deep black cherry ruby with black reflections and some orange in the rim. The bouquet is fresh, with rich sour cherry fruit supported by lively greenish spice from grapes and bracing sour berry fruit acidity too. Quite pleasant to sniff, and has a lot to say. On the palate it's rich, with powerful sour cherry fruit supported by brisk, lively acidity and by smooth sweet tannins that add a cool counterpoint to the warmth of the acidity, and flows into a bright tart berry fruit finish. A beautiful expression of Barbera, and though it is a tad young, they're right, it has a great deal to say and is very pleasant to sniff. It will be perfect with succulent grilled meats, ranging from lamb chops through steak, and will also age nicely for at least 5-8 years. Worth seeking out. Deep cherry ruby that's slightly more intense than the 2006 Bricchi, and black reflections paling to orange. The bouquet is rich, with powerful sour berry fruit supported by minerality and some greenish accents, and also a fair amount of alcohol and some savory sea salt. It is a distinct step up from the Bricchi, in part because of the difference in terrains, but also thanks to a year more in bottle. Beautiful, and very fresh; displaying terrific elegance and depth; one could sniff and sniff again and again. On the palate it's full and rich, with powerful cherry and forest berry fruit supported by raspberry acidity and by deft sweet tannins; the wine is more graceful than the Bricchi, and the acidity more willowy, and this is also its greater age. Very impressive and one could drink it with a rich meal, or enjoy it by itself with like minded friends -- it is a Barbera, with the lively acidity of the varietal, and if you're going to sip it you will have to make certain everyone expects it. This is an Albarossa, a varietal developed by Professor Dalmasso in 1939: a Barbera da Nebbiolo made from a cross between a Barbera and a Nebbiolo that turned out to be a bit rustic. The bunches have tiny berries -- good for extraction, leaves that resemble Barbera, and stems with striations like one finds in Nebbiolo. This is a 2004, the first vintage from an experimental vineyard planted in 2000 (the 2006 vintage, which is aging in bottle, is a Monferrato Rosso DOC). It's deep black cherry ruby with black reflections and cherry rim. Looks interesting. The bouquet is intense, with leathery accents and some brambles, and underlying berry fruit as well, and pleasant spice, a mixture of nutmeg and mace with some coffee grounds, while there is also fairly bright acidity that hearkens to Barbera. On the palate it's quite interesting, with rich berry fruit supported by smooth sweet tannins and by lively raspberry citric acidity that flow into a clean warm finish. Very drinkable, and quite pleasant; it will work very well with simple grilled meats or light roasts, and will go quickly. A cheeky, fun wine with a lively smile. Something to keep an eye out for. Deep ruby with black reflections and ruby rim paling to barest orange. The bouquet is fairly intense, with brambly red berry fruit supported by unusual, and interesting mentholated accents and some herbal notes that bring heather from a cut field to mind, Interesting, and demands attention. On the palate it's ample, with rich slightly sour cherry raspberry fruit supported by dusky raspberry acidity that has shadowy bitter undertones, and is supported by brambly tannins that have dusky bitter notes and flow into a clean bright bitter finish. Quite pleasant, combining power with a certain brambly carefree feel, and will drink well with succulent meals from bollito misto though fried meats and vegetables. An ideal food for richer fatty winter fare, and will also be very nice with succulent grilled meats, e.g. sausages. Beautiful acidity. Rich slightly orange almandine with black reflections and almandine rim. The bouquet is rich, and elegant, with powerful strawberry laced cherry fruit supported by deft greenish accents and pleasant nutmeg spice. It's quick to write, and very young, but also very pleasant to sniff. On the palate it's full and rich with powerful berry fruit laced with yellow peach sweetness and supported by deft sour strawberry acidity, while the tannins are quite young, with a slight burr and very smooth, and flow into a long clean warm finish. Very pleasant, and though it's a sin to drink it this young one could do so with a hearty roast and be very happy. But it will reward those blessed with patience. Expect it to age well for at least 15 years, likely more. Rich almandine with lively ruby reflections and black highlights, and almandine rim paling to orange. The bouquet is elegant, with rich berry fruit that is beginning to reveal rosa canina as well, and clean savory spice from grapes; there's a vibrant youthfulness to it that is extremely pleasant, with some cut tobacco as well that adds depth and complexity. A great lot going on, and one of those wines one could sniff and sniff again. Hints yellow peach too in the berry fruit. On the palate it's ample, rich, and smooth, with powerful cherry and forest berry fruit supported by deft berry fruit acidity and by smooth sweet tannins that have some greenish bitter accents, and flow into a clean bright finish. Very pleasant, and has a lot to say, though drinking it is a bit of a sin now because it really needs another 3-5 years to begin to show its best. It's a child, and a nice one, but has a ways to go. Elegant, lively ruby with brilliant reflections and black highlights, cherry rim paling to orange. The bouquet is absolutely classic, with rich floral accents supported by sandalwood spice and jammy berry fruit with some underlying yellow peach jam, and hints of menthol as well; it's a moving target and very pleasant to sniff. On the palate it's ample and rich, with powerful red berry fruit supported by sandalwood spice and clean rich berry fruit acidity, and by smooth sweet tannins that flow into a bright spicy berry fruit finish with rich floral accents. Very pleasant and will drink quite well with cheeses and cheese dishes, also with friends far from the table. They also poured a bottle of the 1996, which was bottled as a vino da tavola. With respect to the 2007 it's a duskier black almandine with black reflections. The bouquet is interesting, with rich mentholated spice supported by some sandalwood, dried orange peel, and hints of cloves, but what really comes out is the menthol. Very interesting. On the palate it's full, with rich slightly smoky berry fruit supported by menthol spice and some rather dusty sandalwood and also fairly bright cedary acidity that is the grape and not wood. Quite interesting, and though it doesn't have the freshness of the 2007 it is very much alive, and impressively so. I enjoyed it, and it does show that top quality Ruchè can age. This is a Brachetto Secco 2007, though they couldn't indicate the vintage on the label because it's a Vino da Tavola. Elegant ruby with black reflections and cherry ruby rim paling towards pink. The bouquet is rich, with powerful fairly sweet raspberry fruit supported by rich, very ripe strawberries and by strawberry acidity and clean rich greenish accents and spice as it opens. Very pleasant to sniff, and something one could spend considerable time on. On the palate it's rich, with powerful strawberry raspberry fruit supported by deft raspberry acidity and a fair amount of warmth, and also enough sweetness to confer a voluptuous cast, though it's not really sweet. Were it bone dry it would seem much thinner than it is. Very pleasant, and an ideal wine to drink with friends in the evening as the stars come out, or with cheeses including blue cheeses. Impressive and a wine that will bring considerable joy. It was my good fortune that they also opened a bottle of their 1999 Brachetto. It's slightly more almandine in terms of color, with pale orange nail, and has -- as did the Ruché -- a much spicier nose, with considerable menthol mingled with sandalwood and some green leather, also leaf tobacco. Very interesting, and though it's clearly not young it is still quite fresh. On the palate it's rich, with lively berry fruit supported by considerable mentholated spice, and by smooth sweet tannins that flow into a clean fresh berry fruit finish with bright spicy accents. Very interesting, and quite impressive. Wonderful personality. It was a wonderful way to finish a fine day of tasting! Supertuscans: Are they Or Aren't They? Supertuscan is a journalistic term born in the 1970s, and this begs explanation: the 1970s were an extraordinarily difficult period for Tuscan winemaking, especially in the Chianti Classico region, to the point that in some ways it's a wonder that winemaking survived at all. Doesn't seem possible today, but then the area was reeling: in the late 50s and early 60s the tenant farmers who had worked the land for centuries abandoned it in favor of better paying manufacturing jobs in cities and towns (and new homes with amenities such as hot and cold running water, which had not yet reached the countryside). The landowners, who had until then lived in the cities and let someone else run things suddenly found themselves forced to make a go of farming, a task for which most were totally unprepared. So they continued to do what the farmers had done, emphasizing quantity over quality. At the same time, Italy was adopting the Frech AOC system and establishing Denominazioni d'Oridine Controllate, or DOCs to govern the production of the wine. The people writing up the regulations were not winemakers, but rather bureaucrats, so rather than devise a strategy for the future they took a snapshot of the situation at the time, voted to high volume production, and damn near carved it in stone. In Central Tuscany -- Chianti Classico, and Chianti too -- this meant the adoption of the "traditional" red-and-white grape blend said to have been formulated by Baron Bettino Ricasoli, the developer of Chianti: 50 to 80% Sangiovese, 10 to 30% Canaiolo Nero, and 10 to 30% Malvasia and Trebbiano (white grapes), calculated as percentages of vines in the vineyards. The inexperienced landowners read the rules, and since Trebbiano vines (which Baron Ricasoli did not use) produce twice as much as most others, planted as much Trebbiano as they could, assuming that the more Chianti they made the more they would sell. Many were making what was nominally a red wine with 50% white grapes. The stuff didn't age well, didn't travel well, and wasn't well received. Prices plummeted and wineries went with them. By the late 60s the more forward-looking producers realized they had to do something and began to experiment. San Felice introduced Vigorello, a wine made with just Sangiovese, while Antinori introduced Tignanello, a wine made with Sangiovese and Cabernet aged in barriques, the small oak barrels used by the French. Both wines caused tremendous stirs, and soon others were following their lead. Of course, since these wines weren't made according to the Disciplinare governing the Chianti Classico Appellation they couldn't be called Chianti (the tasting commissioners who did encounter them, when faced with unusual non-Italian varietal flavors and small oak, had fits), nor did they qualify as IGT, and therefore the winemakers called them Vini da Tavola, table wines -- the bottom rung of Italian wine production, which had until then been exclusively jug wine. There's something seriously wrong in a system in which the winery's best, most innovative, most interesting (and most expensive) wines are classed along side what's sold by the jug, and since the bureaucrats in charge of the appellations were in no hurry to correct the situation (they didn't officially allow French varietals until 1984, but in doing so continued to require white grapes as well), an unknown -- at least to me -- journalist called the extremely good non-appellation wines he was tasting Supertuscans. And the name stuck. So what, you ask, is a Supertuscan? It's a wine that is not made following the rules of the appellations governing a given wine region. Or maybe it is; Since 1984 the Chianti Classico Disciplinare has been altered several more times, and now many of the wines that could only be called Supertuscan in 1970 would qualify as Chianti Classico. Including Tignanello, though not Vigorello, which is now a Cabernet-Merlot blend. So why haven't the winemakers whose wines now qualify for the appellation they are made in signed them up? In some cases because they feel no need to -- Tignanello is quite well enough known as it is, and calling it Chianti Classico would likely have no positive impact on its sales. 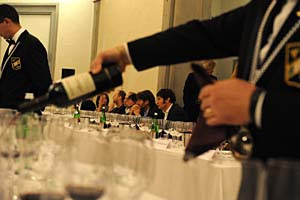 In some cases because they don't want to have anything to do with the Appellation; the late Sergio Manetti of Montevertine withdrew from the Chianti Classico appellation because he didn't want to put white grapes into his red wine, and subsequently -- as the changes in the appellation proved him right -- found the quality controls wanting; his son Martino promised him he wouldn't return to the fold and hasn't. Still others want to be free to do as they want: Giampolo Motta of the Fattoria La Massa started out making Chianti Classico, but felt stifled and left to do his own thing, eliminating Sangiovese from the blend of his top wine, while Tommaso Cavalli of the Tenuta Degli Dei never planted Sangiovese at all. The bottom line is that a Supertuscan is what the winemaker wants it to be, and its quality is entirely dependent upon the winemaker. Piero Antinori, in presenting a vertical of his famed Solaia, perhaps defined it best: A Supertuscan is not a vaietal wine, because while there are some made from only one varietal, many are blends. It's not a reserve or a selection from an Appellation, because in many cases they don't follow the rules set forth for appellation wines. What it is, is a vineyard wine, one that is consistently excellent and stands the test of time. Anyone can call his wine a Supertuscan, but only a few meet the test of time and truly are Supertuscans. Deep black almandine with black reflections and almandine rim. The bouquet is intense, and pleasant, with savory balsamic accents mingled with leaf tobacco and some dried flowers, and also some spice with underlying vegetal notes, moderate pepper and some greenish notes. Quite pleasant, and deft in a mature key. On the palate it's full, and rich, with powerful decidedly savory minerality with some sour berry fruit underlying it, though it's more about minerality and leather than fruit, and supported by savory notes as well that flow into a bitter finish, while the tannins have a marked burr, and are rather savory. Quite pleasant, and very much alive, though it's not a wine I would want to drink by the glass far from the table -- more of a wine for succulent red meats, and in terms of style it is influenced by the cabernet, which gives it a distinctly international feel, especially in the tannins, which are rather dusky. Primarily Merlot with a dash of Sangiovese. Deep black cherry ruby with black reflections; by comparison with the Bossi it looks younger because the ruby is deeper and less orange. The bouquet is fairly intense, with elegant spice mingled with slight iodine accents, green leather, and also black currant fruit Nice balance and considerable depth; it gives a rather lush impression of itself, in a mature key. On the palate it's ample and rich, with powerful cherry plum fruit supported by bright slightly mineral acidity that has some leathery accents -- I get an impression of a leather strop for some reason -- and is supported by very smooth tannins that flow into a clean fresh berry fruit finish -- plum, with some black currant fruit as well. Quite pleasant, and will drink very well with succulent, not too fatty grilled meats or roasts. Deep black cherry ruby with black reflections and almandine rim. The bouquet is dusky, with fairly intense bitter greenish accents mingled with some cedar and savory notes, and also slight balsam, with some black currant fruit as well. It's pleasant, and though clearly not a hot weather wine -- it's more savory and mineral with brambly accents -- is pleasant to sniff. On the palate it's ample, with raich savory plum cherry fruit supported by smooth sweet tannins that flow into a clean fresh berry fruit finish with underlying savory tannic notes and slight hints of balsam; it's quick to write, but quite harmonious, and pleasant to sniff and sip. A pleasant surprise, because the 2005 is rarely this nice. Lively black cherry ruby with black reflections and cherry rim. The bouquet is powerful, and quite rich, with elegant cherry plum fruit supported by pleasant spice and some leathery notes, and also slight underbrush. Quite young, and very elegant in a decidedly international key; it has a great deal to say and is impressive. On the palate it's ample and smooth, with rich powerful cherry plum fruit supported by moderately intense mineral acidity and by dusky tannins that are very smooth and gain definition from dusky pencil shaving bitterness, and flow into a clean fairly rich plum cherry finish with cedary underpinning. Very pleasant in a rich international key, and if you like the style you will enjoy it very much because it has a great many facets to plumb. Even if you're more towards the traditional end of the spectrum you will find things to appreciate and enjoy. It's also quite young, and will develop quite nicely over the next decade or more. Deep black cherry ruby -- it's almost impenetrable -- with cherry rim. The bouquet is muted, though swishing brings up moderate spice and red berry fruit with some balsamic accents; as it opens some cherry plum accents also emerge, together with savory notes. Delicate, and developing. On the palate it's full, and rich, with fairly bright sour cherry fruit supported by brambly acidity and by tannins that have a warm savory burr and flow into a clean rather savory finish with tannic underpinning. It's the antithesis of Cavalli, a wine that revolves more around tannicity and brashness than smoothness, and is a wine that you will enjoy if you prefer more traditional, more aggressive wines, but will also find things to ponder and enjoy if you prefer the softer more international style. Deep cherry ruby with black reflections and cherry rim. The bouquet is powerful, with deft cherry and black currant fruit supported by some vegetal accents and hints of leather with a fair amount of spice as well; it's quite deft, and has a great deal to say in a fairly rich rather international key. On the palate it's full, and rich, with powerful cherry fruit supported by plum accents, and by tannins that are quite young, and though in part smooth, also have a youthful burr to them, and flow into a clean rather bitter berry fruit finish. It's quite pleasant, in a rather scrappy key, and this is its youth at work; it needs a few years for the tannins to smooth and fold in, though it will drink now with a porterhouse steak and be very nice. In other words, if you're impatient all is not lost But if you have patience, it will give a much better accounting of itself in 3-5 years, and continue to do so for many more years thereafter. Elegant ruby with black reflections and some orange in the rim; by comparison with Giorgio Primo it's considerably paler, and this is the difference between Sangiovese and some of the French varietals. The bouquet is elegant, with rich sour cherry fruit supported by some floral accents and deft sour cherry acidity. Quite graceful in a delicate, willowy key that does have considerable power behind it as well. It has a lot to say. On the palate it's full, with powerful cherry fruit supported by bright sour cherry acidity and by tannins that have a warm youthful burr and flow into a clean savory finish with some sour cherry underpinning. Again, it's very young, and will benefit from further bottle age though one could drink it now with a steak. It's a slightly more brambly expression of Pergole Torte than in some vintages, and this is the nature of the vintage. Quite nice, and if you prefer the traditional style you will enjoy it very much. Impenetrable pyrope with black reflections and cherry rim. The bouquet is quite fresh, with powerful black currant fruit supported by some floral accents and wet leather with underlying savory notes and some spice, and also some India ink bitterness. Quite pleasant, and has a lot to say in a very youthful, quite international key. On the palate it's ample and quite smooth, with fairly rich cherry fruit supported by moderately intense sour cherry acidity and by smooth sweet tannins that have a slight cedary burr that is youth, and flow into a clean cedar laced finish. It's quite pleasant in a decidedly Supertuscanish key -- it's almost an archetype of the style (as is Antinori's Solaia, or the Tignanello that follows here), and though I can hear the 1970s talking to me as I sip it, I like it. Deep black almandine with black reflections and cherry rim with slight orange accents. The bouquet is muted at first swish, though more swishing brings up cherry plum fruit with some vegetal notes and hints of underbrush, and also clean spice and some savory notes. It's still developing, and needs time. On the palate it's ample, and smooth, with fairly rich cherry fruit supported by dusky bitterness and bitter mineral acidity, and by tannins that have a cedar laced bitter burr and flow into a rather bitter finish with savory tannic underpinning. It's very young, and needs another couple of years to come together; as is the case with some of the other wines it has a 1970s feel to it, but is quite pleasant and will drink very well with succulent grilled meats or roasts, e.g. leg of lamb. Impenetrable pyrope with black reflections; it's quite dark and this is in part youth. The bouquet is deft, and quite fresh, with violets and some spice mingled with cherry fruit and some ripe plum; there's something luscious about it, though it's clearly a work in progress and needs another couple of years to come together. On the palate it's quite elegant, with rich sour cherry fruit supported by deft sour cherry acidity, and smooth tannins that have slight brambly sour notes to them, and flow into a clean sour cherry finish with savory tannic underpinning. Beautiful depth and great finesse; it has been a number of years since I last tasted Carbonaione, and it is just as exciting to me now as it was the last time. If you like the style, which makes no nods to polished smoothness, but rather captures Sangiovese's rather aggressive nature, you will like it very much, and even if you prefer smoother softer wines you will find things to think about here. So, do these qualify as Supertuscans? I would say they do -- they are as a group distinctive, albeit in very different ways, good, and have certainly stood the test of time. A more important question is, is there still a place for these wines in Tuscany, especially given the swing of the pendulum towards Sangiovese and other autochthonous varietals? Giampaolo Motta said, rather angrily, that he gets frowns and minimization when he tells people that there isn't any Sangiovese in his Giorgio Primo, and I know that some wine journals have downplayed Supertuscans of late. My reaction to the frowns and the downplaying is that the people doing this are missing the boat. Some of these wines do have a slightly 1970s feel, but that's because they were introduced then, and at the time the use of Cabernet and small oak barrels was so revolutionary that it burned itself into our collective conscience; we continue to associate the flavors and aromas with the first time we met them, and that the wines are still being made now as they were then means they are a success, because the winemakers would not still be making their Supertuscans that way if they didn't sell. Others feel quite different -- Cavalli is riper and softer, with more fruit and less wood, more modern if you will (it is a more recent wine) and Giorgio Primo has tremendous depth, while Pergole Torte simply is. They can't really be bundled together, except to say that they stand out, both for their quality, and their character. They are what the winemaker wants to do, and as Vittorio Fiore notes, are also a reaction to the strictures of the Italian Appellations. At the end of the tasting he said, "In Bordeaux the rules take up a single page -- the first lists the varietals that can be used -- 17 or so. Then there's something about yields, and a few more points, but it's all in a page. Here the regulations say how often we should blow our noses in the vineyards. When it comes to agronomy, they say the vineyards should be planted "in the traditional manner," which means that if we plant to high densities, which aren't traditional, a judge could declare us all out of bounds. It's ridiculous." As is, he added, keeping a winemaker from using the grapes he thinks will give him the best expression of his land. And at this point Giampaolo Motta grinned and applauded. A quick introduction: Luigi and Roberto Minuto, the father-and-son team behind Cascina Luisin, were among the first Piemontese winemakers I met, and over the years I have often stopped by to say hello. This year they held an open house after one of the Nebbiolo Prima tasting sessions, and I took advantage of the opportunity to taste their current Dolcetto and Barbera, and to evaluate the 06 Barbareschi after another year of bottle age. We finished with a spectacular treat, which I am grateful to them for having shared. Deep cherry ruby with black reflections and cherry rim. The bouquet is bright, with berry fruit laced by lively berry fruit acidity and some greenish accents. Pleasant, and invites a second (and third) sniff. On the palate it's bright, with lively berry fruit supported by brisk acidity and by tannins that are fairly light, but do have a slight bitter burr and flow into a clean bright slightly bitter finish. It's quite pleasant, and will drink very well with grilled meats or light stews, and though one could give it more time, I would be tempted to drink it now to enjoy its freshness. Lively cherry ruby with black reflections and cherry ruby paling to almandine in the rim. The bouquet is quite elegant, with rich berry fruit supported by brisk acidity and by jaqmmy accents; though it's quick to write it's extremely harmonious and very pleasant to sniff. Young too, and will develop nicely for several years more. In a word, impressive. On the palate it's bright, with rich sour cherry fruit supported by bright berry fruit acidity and by rich brambly raspberry laced tannins that flow into a long fresh finish. Very nice, and will be perfect at a cookout or with grilled or roasted meats. From past experience, I can say the bottle will go very fast. Elegant almandine with black reflections and almandine rim paling to orange. The bouquet is quite elegant too, with rich rosa canina mingled with berry fruit and spice and also with fairly rich berry fruit, plum and prune mingled with forest berry. The overall impression is quite chewy, and feels like it has a ways to go. On the palate it's bright, with rich sour berry fruit supported by berry fruit acidity and by brash slightly bitter tannins that flow into a clean rather bitter finish with a tannic underpinning that continues at length. Elegant, and though it needs another couple of years to come together it will already work very well with grilled meats or roasts -- expect it to also age nicely for another 8-10 years. Elegant almandine with brownish almandine reflections and almandine rim that's not quite onionskin but in that direction. The bouquet is powerful with greenish Nebbiolo accents mingled with berry fruit and spice; it's nicely balanced and elegant but also very, very young, and has a (very) long ways to go. The palate is equally young, in a vibrant key, with rich berry fruit supported by lively acidity and tannins that have a dusky burr and flow into a clean bright slightly greenish finis that goes on at length. You could drink it now, and you would enjoy it, but if you have patience it will richly reward you. A beautiful wine that is well worth setting aside. Almandine with black reflections and almandine rim. The bouquet is pleasant, with fairly rich bright berry fruit supported by lively acidity and some greenish accents with underlying rosa canina. And pleasant greenish accents. Quite powerful and a lot going on; one could sniff it at length. On the palate it's rich, with powerful fairly tannic berry fruit supported by bright acidity and powerful tannins that flow into a bright fairly tannic finish. Quite pleasant, and though young will drink well with grilled meats or roasts, It will benefit from another couple of years of bottle age, however. Deep cherry ruby with black reflections and cherry rim. The bouquet is elegant, with berry fruit supported by spice and underbrush, and by deft underlying cedar. On the palate it's ample, with fairly rich berry fruit supported by savory tannins and smooth savory accents that flow into a clean bright savory finish that goes on at length. It's quite elegant, though you have to like the style; I found myself preferring the unoaked Barbera because it has more life and verve to it. Casting PC aside, the unoaked Barbera is like a pretty girl one might do stupid things over, whereas the Asili is merely (very) good. Pleasing almandine with black reflections and rim paling to almandine. Elegant to look at. The bouquet is elegant, with fairly rich leaf tobacco mingled with spice and savory notes, and a pleasant dusky underpinning. Quite pleasant to sniff, and invites sniff after sniff; one could loose one's self in it. After a while, I taste it: tremendous elegance, with rich leaf tobacco laced with berry fruit and come u, and also savory acidity that carries at length, and flows into a clean savory finish. It's one of those wines that has a great deal to say and one really doesn't want to pour out (in a tasting situation) because it reveals new facets with every sniff and every sip. Beautiful.